The hobby of marine fishkeeping is only relatively recent: the spreading of scubadiving has helped developing awarness and interest in the fascinating, variegated undersea wildlife. 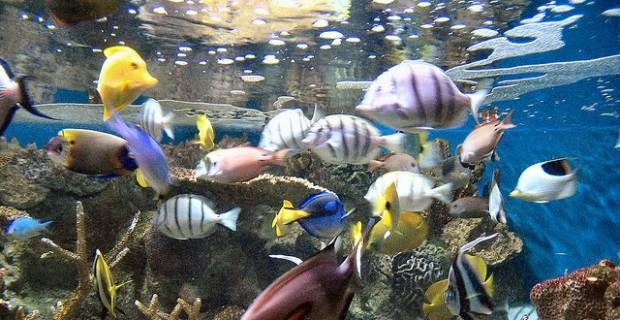 Marine aquariums, especially of the kind containing beautiful tropical fish and reef, can be a delight to hold, but it also comes with specific needs that should be well understood in order to provide the best and healthiest condition to our marine friends. Setting up a marine aquarium is more demanding than a freshwater one, although some equipment is common to the two. The biggest difference between the two is, of course, the quality of the water. It is also, in case of the marine environment, the most difficult thing to achieve. A well balanced salty water, with the right Ph and the right levels of ammonia is the essential condition for your fish health and wellbeing. That's way, before thinking of the fish themselves, a well thought, ahead planning is required in preparing your aquarium. Synthetic salt mixes, new filtration systems, lighting systems that emulate tropical sunshine and moonlight have been developed to fullfil the needs of this increasingly popular form of fishkeeping. Because of the sheer number of pieces of equipment needed, plus all the variables to take into account, some good, ahead planning is required. Best thing to do is to visit different shops, carefully visioning the different styles of tanks, filters and equipments available before starting to plan. A larger tank is better for the fish, who need space to wade about. A larger tank is also easier to control than a smaller one, as it allows more flexibility for the inevitable mistakes. For beginners, a 20 (91 lt) gallons tank is recommended, with 55 (250 lt) gallons being the best option. Most marine creatures require cleaner water than the water we drink from the tap. Water will need high quality salts to be added in the right proportions, and purification units able to rid it of contaminants and impurities. Crushed coral used as a substrate for a marine aquarium helps to maintain the Ph in the tank at the right level. Live sand again is a substrate with the additional benefit of providing colonies of good bacteria that help breaking down waste, acting as an extra filtration system. The under gravel system for biological filtration (UGF) is a plate type filter designed to beplaced under the gravel/biological bed material. The system is run by an air pump and air stones can be very effective in tanks under 55gallons in size, but is appropriate for use in reef tanks. With minimal circulation, it can be more demanding than a wet/dryfilter that requires little maintenance. A wet/dry filter draws water through some filter media, then into a receptacle, usually a sump. As the water passes over the filter media, the ammonia and nitrites in the water are processed by the resident bacteria into nitrates. It is very easy to maintain. Fundamental for an healthy environment in your tank. Sometime, wrong filter sizes or a filter malfunction may cause chemical balances to break up, which could be lethal for the fish. Each type of test kit has its function, with the ones testing levels of ammonia, nitrite and Ph level being the most important. Alteration of any of the above may result in unexpected fish deaths. Fluorescent lights are the most commonly used, less expensive than other types. But remember: in order to sustain undersea life in your aquarium they must be full spectrum fluorescent light bulbs, of at least 5,500 K (preferably between 6,000 K and7,000 K), 2,000 lumens, and have a CRI over 80. Other options available for day light include the new frontier LED lights, MH and HIQ lights, with the best possible option being a wise combination of all the three types. Lunar lights for cool, nightime effect may also be required, especially where fish with night timebehaviour is present. Additionally, always consider buying a timer for set light changes. There is an incredible diversity of marine fish and invertebrates. Normally, these animals are captured in the wild, and go through quite a lot of stress in the handling and shipping process. 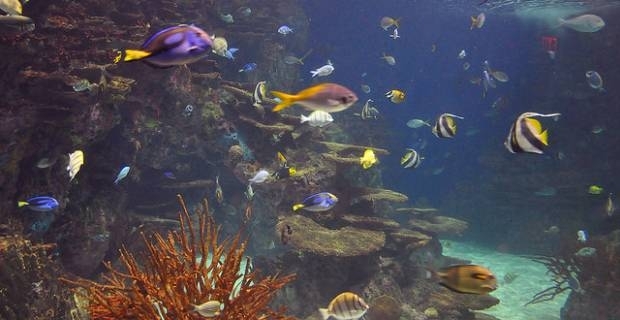 Plus, they are not well suited for rapid changes, so keeping the condition of the marine aquariums is essential. Different species have different personality traits, so it is important to plan ahead what kind of species to allow in your aquarium and how to combine them.